This race begins on the prom below the Expanse Hotel and follows the Land Train path towards Sewerby. Then back along the cliff top path to the Coast Guard Station before doing another loop. The finishing straight then heads back down onto the prom. A new course for 2019 which, it is hoped, should be more traffic friendly. Meet at Ferns Farm Hotel in Carnaby. Race starts near church and heads up Church Lane towards Woldgate. At the junction head straight down the hill in direction of B1253. Just before reaching main road follow a track on right across fields to Boynton. At Boynton turn right again up farm track which leads back up onto Woldgate. At junction with Woldgate turn left in direction of Brid. At junction with Bessingby Hill turn right and follow pavement back to Carnaby village - finishing up Church Lane near the church. Starting and Finishing at Kilham Village Hall. For those who remember, it is basically the old Kilham Freedom Run course. 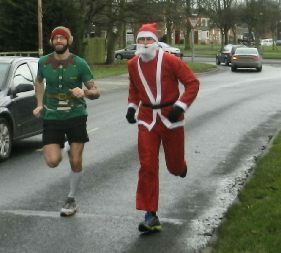 This is run in Fancy Dress. It is also a tradition that we all bring small presents (e.g. bottle of wine, chocs). These are then placed on a table and after the race runners are called forward in the order that they finished to choose a present/prize. This race is also a Staggered Handicap. A series of 4 races to be held between Tuesday 10th September and Friday 13th September. A 5K Beach race, 3 mile hill race at Carnaby, a 1 mile race on Brid Prom and a 10K race at Kilham. This is a Staggered Handicap race i.e. slowest runner sets off first. The race starts and finishes on the prom below Albion Terrace Car Park. The course sets off along Beaconsfield Prom and the Land Train path to Sewerby. Then into the grounds of Sewerby Hall before turning left by the bandstand through the main Gateway and right along Church Lane. Follow the road around to the entrance lane at Danes Dyke. Head to the end of the lane and down to the beach - then climb the steep path to the top of the Dyke. Back across golf course and Land Train path to the Finish on Beaconsfield Prom.